One reason I do think is perhaps valid for some people is the shallower Depth of Field (DOF) that Full Frame will give you. However how MUCH of a difference is there really and is it worth someone going Full Frame? I’ll tell you, for me I don’t feel the difference (in real world shooting, not just side by tests) is enough. 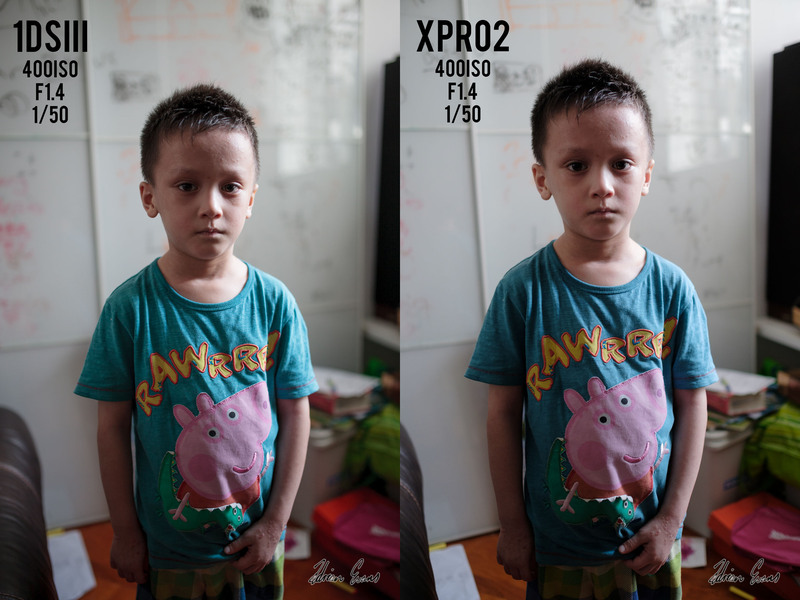 However, I have put together this very, very quick test using my son to see the difference between the Canon 1DsIII (a 35mm sensor camera) and the Fuji Xpro2 (an APS-C camera). I am comparing two of the best 35mm equivalent lenses out there (that don’t cost an arm and a leg), both of which are a similar price. On the 35mm (Full Frame) camera I am shooting with a Sigma 35 1.4 Art and on the X-Pro2 I’m using the 23mm 1.4. The purpose of this comparison is to give myself and whoever stumbles across this a sample of the DOF difference you’ll experience going from FF to Fuji or vice versa. NOTE: DOF is different to bokeh. Bokeh is the quality of the background blur. DOF is how much of the subject is in focus. Bokeh between lenses will differ, so this isn’t really a bokeh test. However, I’d like to compare the difference in DOF in real life between a 35mm sensor and the Fuji APS-C sensor, and for myself, see if it’s worth keeping my 1DsIII for occasional use. Two compared. I did the same settings despite fuji using a slightly different ISO standard. Matched Histograms the best I could. At first glance these photos look quite similar. I prefer the 1DsIII one personally because I like my son without forehead distortion (lens or angle problem, nothing to do with the sensor). With closer inspection I can definitely see a difference in the DOF/background blur. Subject separation looks quite similar though. The Fuji 23mm seems to have a bit more distortion, that could be the angle, again this isn’t the most scientific of tests. Distortion tests are best done on a tripod etc. 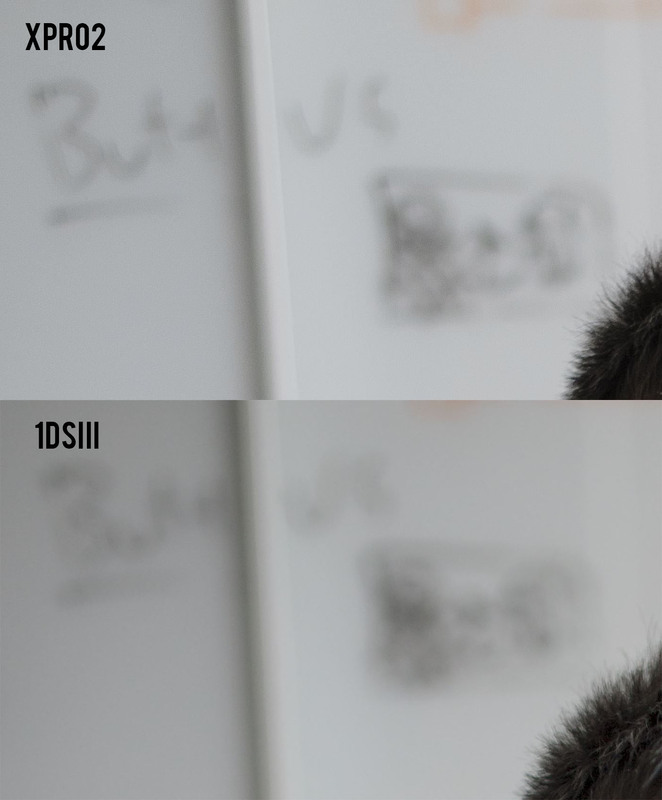 There’s definitely more blurring with the 1DsIII. Whether this difference is enough to warrant a 35mm camera I don’t know. Details is an interesting comparison. The 1DsIII has 22MP and the Xpro2 has 24MP. So the xpro will have more details on the whole. A 36MP+ 35mm sensor will of course have a lot more resolution too, so if having the most resolution is important a 35mm sensor can be the best bet. The 1DsIII seems to have a tad more skin details in there, but if you look at the iris, the blacks on the 1DsIII look quite blotchy. Seems the Full frame sensor maintains more details. Is this my focus being slightly off, the lens or the sensor? Hopefully it’s noticeable on the web as it is on photoshop. 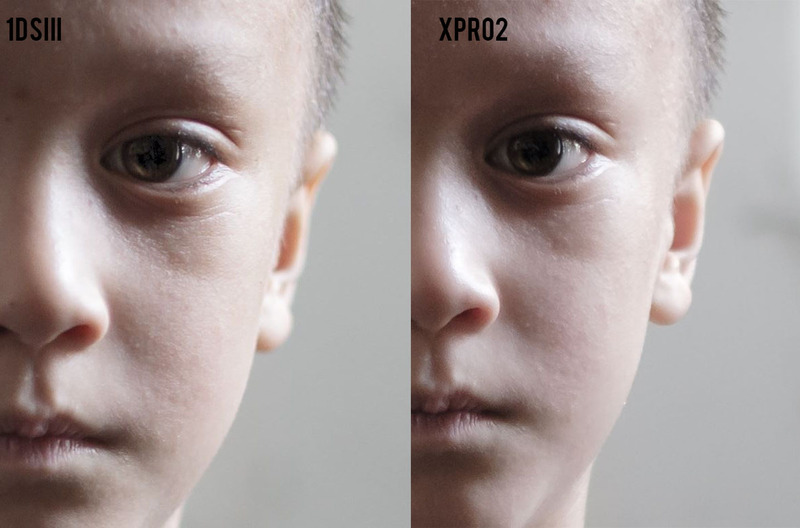 But the Xpro2 seems to fall off more naturally in the blacks. This may be a fault of the 1DsIII sensor, not the fault of the sensor size. I just found this interesting. NOTE: I’ve since determined this sharpness issue is more of a lens issue. The Fuji 23mm 1.4 is slightly soft at 1.4 and the Sigma 35 1.4 is incredibly sharp at 1.4. Falloff is smooth on both cameras/sensors, but the 35mm (Full Frame) sensor has a quicker fall off obviously, the ear is slightly blurrier. This test IS NOT very scientific, I didn’t use a tripod, I just set the cameras at the same settings and used lenses that give a 35mm FOV. It shows that there is some difference in DOF between a 35mm format sensor (called “Full Frame” by many) and a APS-C sensor (x1.5 crop factor of the full frame sensor). Is it enough to warrant keeping the Full Frame camera? Well, time will tell. I still want to do detail tests using a tripod etc. I’ll leave it up to the reader to judge if the difference in DOF/Blur is enough for them to warrant buying a Full Frame camera or not. Thanks for the review. I wish you could do that with tripod from same position. With full frame sigma, i can see that background is more away from subject if you compare it aps-c 23. I would like to have FF sensor in X-pro2..
Yeh mate, it’s not the most scientific of comparisons. A bit more real world. On Monday, when I have a bit more time, I’ll try and set up a tripod and some static objects for a bit better a comparison. You can see though there’s a difference of course, but unless you’re a DOF nut (like you 😉 ) Full Frame doesn’t exactly hop off the page better. This would all be meaningless in a good photograph. Good photographs don’t depend on this type of pixel peeping. Either camera is very capable of taking excellent photographs, but why lug the boat anchor of a full frame and the weight of the lenses when you don’t need to? After a few photos, it wouldn’t make a difference but hauling 3 lenses and two bodies around on a full day in the mountains or crowded streets in a 3rd world country, it would make a huge difference, in my opinion.